The title of this post probably reads like the mad, drug-fuelled scream of a drunk Saturday night party animal, but the elements of it may be VERY important for a particular kind of Parkinson’s disease. Mutations in a gene called DJ-1 can cause an early onset form of Parkinson’s disease. The protein of DJ-1 plays an important role in how cells handle oxidative stress – or the increase in damaging free radicals (explained below). This week researchers announced that they have found an interesting new therapeutic target for people with DJ-1 associated Parkinson’s disease: A chemical called Isocitrate. In this post, we will discuss what DJ-1 is involved with Parkinson’s disease, how isocitrate helps the situation, and what the results of new research mean for future therapeutic strategies. In 2017, we are not only observing the 200 year anniversary of the first description of Parkinson’s disease (by one Mr James Parkinson), but also the 20th anniversary of the discovery of the first genetic variation associated with the condition (Click here to read more about that). Our understanding of the genetics of Parkinson’s disease since 1997, has revolutionised the way we look at Parkinson’s disease and opened new doors that have aided us in our understanding. During the last 20 years, we have identified numerous sections of DNA (these regions are called genes) where small errors in the genetic coding (mutations or variants) can result in an increased risk of developing Parkinson’s disease. 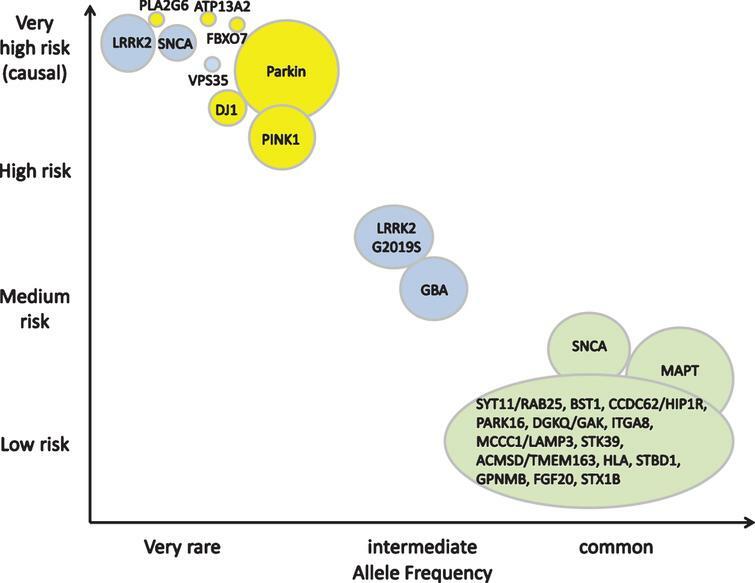 As the graph below indicates, mutations in some of these genes are very rare, but infer a very high risk, while others are quite common but have a low risk of Parkinson’s disease. Some of the genetic mutation need to be provided by both the parents for Parkinson’s to develop (an ‘autosomal recessive‘ mutation – the yellow circles in the graph above); while in other cases the genetic variant needs only to be provided by one of the parents (an ‘autosomal dominant’ mutation – the blue circles). Many of the genetic mutations are very common and simply considered a region of increased risk (green circles). Importantly, all of these genes provide the instructions for making a protein – which are the functional parts in a cell. And each of these proteins have specific roles in biological processes. These functions tell us a little bit about how Parkinson’s disease may be working. Each of them is a piece of the jigsaw puzzle that we are trying to finish. 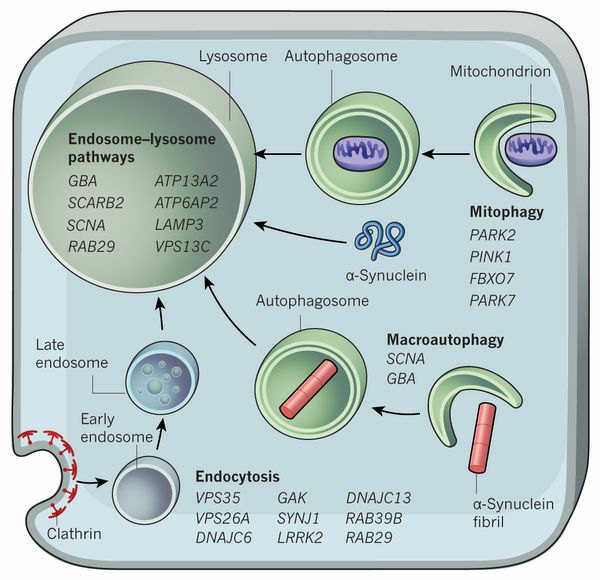 As you can see in the image below, many of the genes mentioned in the graph above give rise to proteins that are involved in different parts of the process of autophagy – or the waste disposal system of the cell. You may notice that some proteins, like SCNA (otherwise known as alpha synuclein), are involved in multiple steps in this process. In today’s post we are going to look at new research regarding just one of these genes/proteins. It is called DJ-1, also known as Parkinson disease protein 7 (or PARK7). Over the Christmas festive period an interesting study was published in the journal Proceedings of the National Academy of Sciences (PNAS). It was about a protein called Nuclear Factor Erythroid 2-Related Factor 2 (Nrf2) that has some impressive properties that could be good for Parkinson’s disease. In today’s post we will review the results of the study and discuss what they mean for Parkinson’s disease. Antioxidants are one of those subjects that is often discussed, but not well understood. So before we review the study that was published last week, let’s first have a look at what we mean when we talk about antioxidants. An antioxidant is simply a molecule that prevents the oxidation of other molecules. Well, the cells in your body are made of molecules. Molecules are combinations atoms of one or more elements joined by chemical bonds. Atoms consist of a nucleus, neutrons, protons and electrons. Oxidation is simply the loss of electrons from a molecule, which in turn destabilises the molecule. Think of iron rusting. Rust is the oxidation of iron – in the presence of oxygen and water, iron molecules will lose electrons over time. Given enough time, this results in the complete break down of objects made of iron. A free radical is an unstable molecule – unstable because it is missing electrons. They react quickly with other molecules, trying to capture the needed electron to re-gain stability. Free radicals will literally attack the nearest stable molecule, stealing an electron. This leads to the “attacked” molecule becoming a free radical itself, and thus a chain reaction is started. Inside a living cell this can cause terrible damage, ultimately killing the cell. Interesting, but what does all this have to do with this new gene Nrf2? Well, Nrf2 is a ‘transcription factor’ with some interesting properties. What is a transcription factor? So you remember your high school science class when some adult at the front of the class was talking about biology 101 – DNA gives rise to RNA, RNA gives rise to protein. Ultimately this is a circular cycle, because the protein that is produced using RNA is required at all levels of this process. Some of the protein is required for making RNA from DNA, while other proteins are required for making protein from the RNA instructions. Now, a transcription factor can be an ‘activator’ of transcription – that is initiating or helping the process of generating RNA from DNA. Nrf2 is an activator of transcription. When it binds to DNA to aids in the production of RNA, which then results in specific proteins being produced. And this is where Nrf2 gets interesting. You see, Nrf2 binds to antioxidant response elements (ARE). Antioxidant response elements (ARE) are regions of DNA is commonly found in the regulatory region of genes encoding various antioxidant and cytoprotective enzymes. The regulatory region of genes is the section of DNA where transcription is initiated for each gene. They are pieces of DNA that a transcription factor like Nrf2 binds to and activates the production of RNA. ARE are particularly interesting because these regions reside in the regulatory regions of genes that encode naturally occurring antioxidant and protective proteins. And given that antioxidants and protective proteins are generally considered a good thing for sick/dying cells, you can see why Nrf2 is an interesting protein to investigate. By binding to ARE, Nrf2 is directly encouraging the production of naturally occurring antioxidant and protective proteins. And this is why a lot of people are excited by Nrf2 and call it the ‘next big thing’. So what did the new research study report? Well, this is where the story gets really interesting. Title: Nrf2 mitigates LRRK2- and α-synuclein-induced neurodegeneration by modulating proteostasis. Authors: Skibinski G, Hwang V, Ando DM, Daub A, Lee AK, Ravisankar A, Modan S, Finucane MM, Shaby BA, Finkbeiner S.
Journal: Proc Natl Acad Sci U S A. 2016 Dec 27. pii: 201522872. The researchers wanted to determine what effect introducing exaggerated amounts of Nrf2 into cell culture models of Parkinson’s disease would have on the behaviour and survival of the cells. There were two types of cell culture models of Parkinson’s disease used in the study: one produced a lot of the Parkinson’s associated protein alpha synuclein (normal un-mutated) and the other cell culture model involved two mutations in the Lrrk2 gene (we have previously discussed Lrrk2 – click here to read that post). The researchers had previously demonstrated that both of these cell culture models of Parkinson’s disease exhibited increased levels of cell death when compared with normal cells. In the current study, when the researchers artificially exaggerated the amounts of Nrf2 in both sets of cell cultures, they found that not only did Nrf2 reduce Lrrk2 and alpha-synuclein toxicity in cell culture, but it also influenced alpha-synuclein protein regulation, by increasing the degradation of the protein. This means that Nrf2 increased the disposal of the unnecessary excess of alpha synuclein. In addition, Nrf2 also promoted the collection of free-floating mutant Lrrk2 and bundling it up into dense ‘inclusion bodies’ – dense clusters which are similar to the Lewy bodies of Parkinson’s disease but inclusion bodies are not associated with cell death. The scientists concluded that excessive levels of Nrf2 help to make the cells healthier and that this could represent a new target for future therapies of Parkinson’s disease. The researchers acknowledge that the ARE-related features of Nrf2 may be also playing a beneficial role in the cells, but this is the first time the alpha synuclein and Lrrk2 features have been identified. Sounds great. Are there any catches? Yes, a very interesting one. The response of Nrf2 is time-dependent. The researchers found that over stimulation with Nrf2 leads to natural compensation from cells that eventually limits the activity of Nrf2. In other words, too much of a good thing loses it’s affect over time. Biology is one giant balancing act and sometimes when one factor is artificially introduced, cells will compensate regardless of whether it’s a good thing or not. The researchers suggested that this issue could potentially be over come by periodic use of Nrf2, rather than simply chronic (or continuous) use of the protein. This still needs to be determined, however, in follow up experiments. This new study provides us with new data relating to a protein that has been seen as holding great promise in the treatment of neurodegenerative conditions (not just Parkinson’s disease). The new research, however, demonstrates some interesting characteristic of Nrf2 specific to two Parkinson’s disease related genes. Nrf2 has been considered a drug target for some time and agents targeting this protein have been patented and are under investigation (Click here to read more on this). We will be keeping an eye out for these compounds and we’ll report here the results of any research being conducted on them. We have previously discussed the treatments for Parkinson’s disease that were prescribed in India over 2000 years ago (Click here for that post). Outlined in the ancient texts, called the ‘Ayurveda’ (/aɪ.ərˈveɪdə/; Sanskrit for “the science of life” or “Life-knowledge”) was the use of the seeds of Mucuna pruriens in treating conditions of tremor. The seeds of this tropical legume we now know have extremely high levels of L-dopa in them (L-dopa being the standard therapy for Parkinson’s disease in modern medicine). A second popular Ayurvedic treatment that is popular for Parkinson’s disease is Curcumin. Curcumin is an active component of turmeric (Curcuma longa), a dietary spice used in Indian cuisine and medicine. Curcumin exhibits antioxidant, anti-inflammatory and anti-cancer properties, crosses the blood-brain barrier and there are numerous studies that indicate neuroprotective properties in various models of neurological disorders. Curcumin has also been shown to activate Nrf2 (Click here , here and here for more on this). It has also been shown to prevent the aggregation of alpha synuclein (click here for more on this). We are always amazed at the curious little connection with ancient remedies that can be found in modern research and medical practice, and we thought we’d share this one here. EDITORIAL NOTE: The content provided by the Science of Parkinson’s website is for information purposes only. It is provided by research scientists, not medical practitioners. Any actions taken – based on what has been read on the website – are the sole responsibility of the reader. The information provided on this website should under no circumstances be considered medical advice, and any actions taken by readers should firstly be discussed with a qualified healthcare professional. It seems everyday we read stories in the media about the benefits of these things called antioxidants. We are repeatedly told that we ‘need more antioxidants in our diet’, because they will help to stave off debilitating conditions like Parkinson’s disease. Last week, however, a study was published which indicates that this may not be the case. In todays post we look at antioxidants and their impact on Parkinson’s disease. While human being are pretty poor at producing antioxidants, plants produce LOTS! Thus vegetables and fruits are a fantastic source of antioxidants. The Oxygen radical absorbance capacity (ORAC) score mentioned in the figure above is a method of measuring the antioxidant capacity of various substances. For comparative sake, a piece of tofu has an ORAC score of approximately 90, a beef steak has an ORAC score of approximately 10, and a ‘Redbull’ energy drink has an ORAC score of 0 (as they all have very few antioxidants – Source:Superfoodly). A source of major antioxidants are vitamins (such as beta-carotene, vitamin C, and vitamin E). Vitamins are essential nutrients that our bodies needs (in small amounts) to function properly. Many of them are also potent antioxidants. Vitamin C (or ascorbic acid), in particular, is a powerful antioxidant and it is found in both animals and plants. Unfortunately for humans, however, one of the enzymes needed to make ascorbic acid was lost by a genetic mutation during primate evolution, and so we must obtain it from our diet (eat lots of oranges folks). How could antioxidants work for Parkinson’s disease? Postmortem analysis of the brains of people who had Parkinson’s disease has revealed numerous signs of oxidative damage, and this has lead to many researchers hypothesising that oxidation is a key component of the disease. So what research was published last week? Title: Intake of antioxidant vitamins and risk of parkinson’s disease. Authors: Hughes KC, Gao X, Kim IY, Rimm EB, Wang M, Weisskopf MG, Schwarzschild MA, Ascherio A. Journal: Movement Disorders. 2016 Oct 27. doi: 10.1002/mds.26819. In this study, the investigators wanted to look at the consumption of antioxidant vitamins and the risk of developing Parkinson’s disease. In order to do this, they needed large pools of medical data that they could analyse. They used the databases from the Nurses’ Health Study (NHS) and the Health Professionals Follow-Up Study (HPFS) in the USA. The investigators in the current study, removed the data from people who reported ‘implausible total energy intake at baseline (<660 or >3,500 kcal/day for women and <800 or >4,200 kcal/day for men)’, missed reporting for any survey, or had a diagnosis of Parkinson’s disease at the start of the study. This left them with the survey results of 80,750 women and 48,672 men to analyse. From these pools of subjects, they found a total of 1036 people with Parkinson’s disease (554 in HPFS and 482 in NHS). When the investigators looked at antioxidant vitamin consumption, they found that vitamin E was not associated with an increased or decreased risk of Parkinson’s disease. Vitamin C intake showed indications of reducing the risk of developing Parkinson’s, but this not significant. The investigators concluded that their results do not support the hypothesis that consumption of antioxidant vitamins reduces the risk of Parkinson’s disease. What about other Parkinson’s disease research on antioxidants? Title: A randomized clinical trial of high-dosage coenzyme Q10 in early Parkinson disease: no evidence of benefit. Authors: Parkinson Study Group QE3 Investigators., Beal MF, et al. Journal: JAMA Neurol. 2014 May;71(5):543-52. This article reported the results of a phase III randomized, placebo-controlled, double-blind clinical trial at 67 North American sites, consisting of 600 participants. While Coenzyme Q10 was safe and well tolerated by the subjects in the study, it demonstrated no evidence of clinical benefit. One justified critique of this study, however, was the variety of subjects with Parkinson’s disease involved in the study. It has been suggested that a clinical trial should be performed with coenzyme Q10 in people with Parkinson’s disease who have a proven mutation in the PINK1 gene as these are the subjects who are most likely to benefit from this approach. That would be an interesting trial. Well, the study published last week needs to be replicated with another large database before any serious conclusions can be made. For all the hype around antioxidants, however, there is a worrying lack of supporting evidence that they actually have any effect (in the case of lung cancer there are even suggestions that some vitamin antioxidants could exacerbate the situation – click here for more on this). The results of the study reviewed above do suggest that our view of oxidation in Parkinson’s disease needs to be re-addressed. It may be that oxidation may simply be an end step in the condition, and trying to block it with antioxidants is fruitless. It should be noted that we are not suggesting here that people should stop taking antioxidants – they are an important part of any balanced diet, necessary for normal biological functioning. We are simply presenting the evidence that some of the hype surrounding their potential is unfounded. As usual, as more information comes to hand, we shall present it here. Watch this space.